As a self-proclaimed-obsessive- ice cream-consumer, I’ve searched south Florida for some of the best local ice cream shops. Why not have smooth, creamy, delicious ice cream while also supporting local businesses? It’s a win-win. Here are some of the best local ice cream shops in sunny south Florida. Home of the razzleberry ice cream. A personal favorite would be the coconut ice cream. Seriously – it’s so good that I order it every. single. time. I go here. I can’t get any other flavor at the moment because I’m obsessed with the coconut. This family owned shop makes ice cream onsite and is located right next to Pompano Beach and the Pompano Beach Pier (one of the only free piers to walk on). Ice cream and a beach view? Count me in. *FYI* Razzleberry’s only accepts cash so keep this in mind or you’ll end up looking strange paying with mostly coins (yes, I’ve done this before…that’s how bad I wanted this ice cream). Like having ice cream at a carnival. This place is a local heritage and favorite of south Floridians. Fun decor and atmosphere complete with GIANT servings of ice cream. Bring your whole squad or family (might as well invite the extended family as well) to share in on the ice cream. 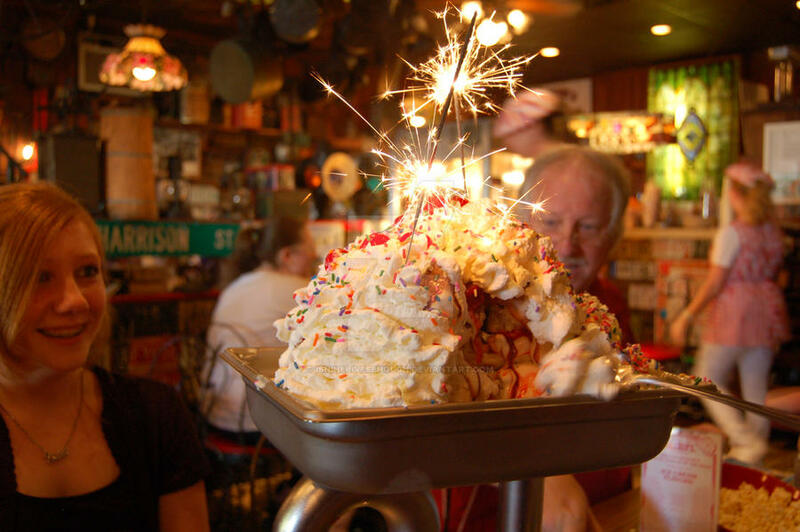 There’s even a “Kitchen Sink” option – basically a sink full of multiple ice cream flavors with a side of happiness for parties of four or more. Overall, Jaxon’s may seem a little pricey for ice cream, but sharing with others totally makes it worth it! Plus, they serve you popcorn while you wait for your food – double yum. Prepare to wait if you go during peak hours on weekends…like I said, this place is a south Florida fav, so it can get packed pretty quickly. One of the only places open late (until 1 am). Has dairy free/vegan/gluten free ice cream as well! They have some super interesting and unique flavors created by Chef DJ Colby- make sure to try some samples, even of flavors you wouldn’t normally try. Some of the combinations are so crazy sounding, but they taste fantastic! Flavors like pineapple and cilantro, jackfruit, etc. have graced their ingredient lists. Top it off with some caramel whipped creme. What’s your favorite ice cream flavor? LEt me know in the comments below!